Means of the Study (Research) Ground·In the years 1960 to 1965, carried out by the Institute of Meteorology, University of Darmstadt, with the support of the Federal Ministry of Economics, studies with devices measuring dust precipitation and –concentration were undertaken. The idea was to compare the measurements from devices for dust concentration among each other as well as with those from devices for dust precipitation. For this purpose, a study (research) ground has been set up at the Mannheim industrial area on the Friesenheimer Island. In that area, the measured quantities of weekly averages of dust precipitation and -concentration are still so large that a few day’s exposure suffices to find evaluable sample quantities. The variables are locally sufficiently constant within the study (research) ground, because in the immediate vicinity is no source of dust, the area does not lend itself to any turbulence which would affect airflow (buildings, vegetation, landscape). Grass cover keeps swirling dust low. Of each device type several were erected, so that statistical evaluation methods can be applied. All devices were positioned in a way that they uniformly sampled the air at 1,6m above ground, except for some devices which were erected specially to study the dependence of the result on the sampling height. 1. 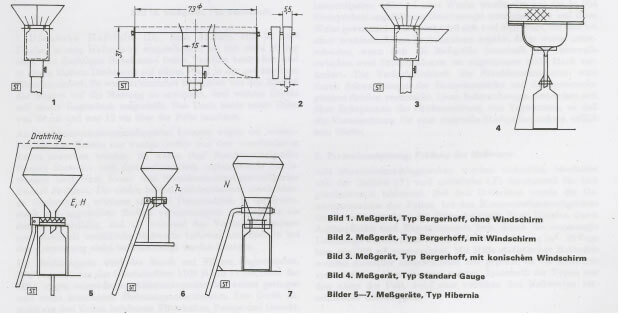 Type Bergerhoff (B) (Figure 1). A 1,5 litre jar with a 61 cm2 collecting area stands in a well-fitting wire basket on a pole. Initially, 10 devices were studied, later 4. In order to investigate the effect of objects impacting on the airflow around the devices 3 (B) devices with wind screens (figure 1) were erected, one older Bergerhoff model (BA) (figure 2), 4 units with conical screens to our own design (BS) (figure 3) and 4 units detached without basket (B0). 2. Type Engl. Standard Gauge (G) (figure 4). A flat glass funnel with a collection area of 770 cm2 is connected by a tube to the collection bottle underneath. Around the opening of the gathering funnel runs a wire mesh ring, 10 cm wider than and 10 cm above the funnel rim. Funnel and bottle rest open on a tripod. 3 of these devices were tested. 3. Type Hibernia (H subtypes h, E, N) (images 5-7). 4. Type Löbner – Liesegang (L) (Figure 8). The funnel is made of stoneware, has a 770 cm2 collecting area and is located on a metal cylinder of the same diameter. In that cylinder the collection bottle is positioned. There is a bird protection grid (mesh) attached, similar to the G-device. In order to determine its influence on the measured values given by with these devices, some of the 10 were temporarily used without any bird guard or with other kinds of grids. 5. AP CA – Standard (U) (Figure 9). 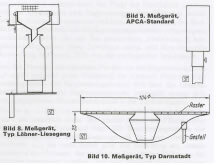 Type Darmstadt (A) (Figure 10). ·Koschmieder had been suggesting a new device, on the grounds of theoretical considerations. Soon after the investigation had started, three of his devices were constructed and mounted. A shallow dish of transparent plastic, 25 cm high and 103 cm in diameter bears at its center a vessel with 200 cm2 gathering area, which also serves as collection vessel. The space between the receptacle and the edge of the dish is covered with a flat PVC mesh of quadrants (squares) with a side length of 2cm. The top of the dish, grid and collection vessel all form a horizontal plane. This particular form of the instrument was meant to interfere as little as possible with the natural airflow when passing over the opening of the collection vessel, thus impacting the precipitation process as little as possible. 7. Diemsche Adhesive Film /membrane (D). An Aluminium foil/membrane of 33 cm2 area is inserted into a retaining plate, is coated with a layer of Vaseline, about 50 mg, free of volatile substances and exposed in a small wire basket on a pole at the desired height. Initially 10 of these devices were used, later an additional three with a rain cover were erected, which were to determine the effect of the rain on the measurement. These covers had a diameter of 24 cm and were installed 12 cm above the foil/membrane. As to devices measuring the dust concentration (mg/m3 – Active Collection), only few units of three different types were purchased, due to the significantly higher cost. There were five dust-collection devices type Sartorius and three dust-scales registering automatically, designed by Gast, further three devices measuring dust concentration type Ströhlein. ··At the study ground, the Friesenheimer Island, the open atmosphere is highly contaminated with aggressive substances. The first two types of these devices (Type Sartorius, and Gast), which electrostatically separate dust from the air, proved during endurance testing to be so susceptible to interference that only sporadically would they supply reliable measurements. ·Therefore, they could not be considered in the evaluation. In Ströhlein devices the dust is deposited on filters. We used the MSA glass fibre filter 1106 B with 11 cm diameter, because of its high collection efficiency and its low and fairly constant flow resistance. The device consists of three parts, a heatable filter holder, pump and gas meter. The parts are connected by hoses and mounted one above the other in a mount covered by a plastic membrane. (Like with the collecting surfaces of the devices measuring dust-precipitation). ·The suction opening, a tube of 2 cm diameter is found at 1,6 m height. It is covered with a metal cap as a rain cover. The amount of air taken in did not exceed 200 l/min and was usually throttled to lower values. In the measuring field, wind speed and direction were registered and recorded, amount of rain, temperature, humidity, air pressure and solar radiation. The devices were systematically distributed over the measuring field. The shortest distance between two neighbouring devices had initially been 2m. Then fears arose that the turbulence caused by one device might be strong enough that a neighbouring device only 2m downwind might give incorrect precipitation measurements. Therefore, the minimal distance was increased a few weeks after the start of the studies to 3,5m. It can be accepted that this step made sense, as the two device-types studied, type B and type L, gave a much narrower spectrum of data than before the distance was increased. A 1,5m high fence made of coarse wire mesh ran around the whole study grounds. But it never came closer than 5m to any device. The air in the sampling area is strongly polluted with dust. That fact allowed for 7-days- measurement periods. Some devices measuring dust-concentration were exposed over several periods, thus checking the influence of the exposure period. At the end of an exposure period, the dust from the funnels of the bottle-dust-collectors had to be washed down to collect all the dust, using 200ml of distilled water, which was flushed into the collection bottle. As the devices B, U and A, do not contain a separate collection bottle, this flushing process was unnecessary. As in cold and / or stormy weather, this washing procedure is hard work, as it was difficult to accurately wash down the dust. As some of these devices often had no liquids in the container, 200ml of distilled water were added in the laboratory. The collection periods of dust-concentration measurements coincided with those of dust-precipitation. The devices measuring concentration were switched on/off by a microcontroller (timer) for 5 minutes three times every hour. Thereby, the wear and tear on the devices was reduced and at the same time it guaranteed that the flow resistance of the filter would not increase too much. The exact on-time was measured by electrical hour meter. The mean/average dust concentration during a week was therefore calculated from the 504 sampling amounts of dust (On for three times every hour in a 7-day period for 5 min at a time). The mean value obtained this way will vary little from the value which would result from continuous sampling, if the amount measured does not vary greatly between those sampling moments. The dust-concentration is impacted by fluctuations of the emission intensity and those of meteorological parameters. As these variations extend over periods not longer than periods of one day, the conditions are right for meaningful sampling. All dust precipitation samples were processed uniformly. The soluble (Y) and the insoluble (X) dust content were measured by gravimetry. In D-devices, the total weight gained by the foils/membranes was determined, in devices measuring dust concentration the weight gained by the filter. These values were then divided into the collection area and exposure time, or by the amount of air sucked in. The outcome was a cypher, which was converted into the dimension g/m2 x 30 days or mg/100m3. Using statistical methods outliers were eliminated, and it was checked whether the measured values showed systematic deviations. Within each type, this was not the case, but rather between the measurements given by the different kinds of devices. 6.1. Relations between Devices Measuring Dust Concentrations. “N” is – the number of measurements taken. To each of the kNj (with the type of device being k in the measuring period j) the value found knji (where i = l,…kNj) all the lNj (with the type of device being l in the same measuring period) are compared to. To each of the Nj = kNj–lNj pairs of values, a dot is attributed in a right-angle system of coordinates kn, ln. The measuring periods j=l,…M results in a cluster of dots around the point knj, lnj. Below is the German original just in case the above translation is not correct. To determine the relationship between the measured values of the different types of devices measuring dust-concentration the method of linear regression has been applied; in other words, it was assumed that (in the first approximation) the relationship is linear. As The two correlated values are equal in their variability as to their exactness of measuring and measuring unit, and as a clear relation between the two is desirable, the formula of the regression line was derived from the condition. Here dj is the vertical distance of point (knj, lnj) to the regression line. In contrast to this, that distance is usually measured parallel to a co-ordinate axis, and according to the choice of parallelism, generally two regression lines arise. In the conventional regression method changes in the scale of the variable do change the regression parameters accordingly. Using the dj regression, in contrast, with the vertical distances, does not have that invariance. In cases like this one, the less conventional dj regression can be applied meaningfully. D(a) = 8u X t (N-2, 1-a), where t (N-2, 1-a) is the amount of the values of t, within which the a-times proportion of the area under the curve of the t-distribution lies. The determining factors of the regression lines are lead dimension bkl the section of the ordinate akl; the first index indicates the type of device, the measured values of the co-ordinate are assigned to the measured values of the ordinate, the second type. From the distance D(a), the confidence intervals D(a)kl. This is the area on either side of the regression line, in which is one finds the measured value of kn of the device type k, which belongs to the measured value ln of the device type l can be found with probability a. The degree of regressive correlation is characterized, as usual, by the coefficient of determination Bm. Bm = 0 means that no linear relationship exists, Bm = 1 means that there is one. In Table 1, with the measurements so obtained, we restrict ourselves to the most important device types. There are Z measured values (Z= X + Y) used for 7 days exposure time. For (probability) a we chose 0.9. The last column shows the period specified, from which the measured values were obtained. Here for instance 8/61 indicates the eighth week of the year 1961. The sections akl equal, except in the regression G / H, a probability of a > 99.9% ≠ 0. Giving a conversion factor does not do complete justice to the relation between the measured values of the different device types, though. A measure of the uncertainty of a device type is the dispersion of the individual values of measurement period to its mean value, which is shown in Table 2, line. 2 The differences between the variations have emerged as secured. Line 4 shows the variations of the respective mean value (row 3) (coefficient of variation). Line 5 gives the sample quantities corresponding to these mean values. The uncertainty of the G-devices is significantly lower than that of the others, which differ little from each other. The absolute laboratory errors are likely to be independent of the device type and are relatively most significant in the B-device. Variation coefficients of types B, H and L are nevertheless more or less the same, which is likely a result of the outcome (as they need to be washed out).· At H and L dust is lost by wind acting on the dust filters (see below). That the error with the G-type is smaller, we explain by the fact that, with the funnel being made from smooth glass, it is possible to rinse the dust out thoroughly. It was first examined whether the amount measured in concentration devices (c) was in any way dependent of the air speed (w) at the suction opening of the meter. During 82 measuring periods, the 3 instruments were operated with different air velocity. The regression coefficient calculated from these values was very small and the probability was vanishing ≠ 0. However, the wind (w) varied only in the range from 2 to 10 m/s. It is most certain that there is in fact a correlation c= c (w). But it was outdone by other influences, so that we did not have to take it into account when using the measured values. 5. determination (%); 6. Number of value pairs from which the regression was calculated; 7. arithmetic average of measured values of dust precipitation; 8. Arithmetic means of the measured values of dust concentration. According Z = X + Y, the pitch dimensions and intercepts (lines 1, 2, 3) add up. The security of the connection is greater for the Z values than for the X and Y values by themselves. The values for devices with wind screen (lines 7, 8, 9) differ little from one another, but stand out clearly from the other amounts. The pitch dimensions are greater than those for the other devices, greater than it corresponds to the conditions of the precipitation averages, as well as the coefficient of determination. The values in row 5 slot the G-device between those with and without screen. All the regressions have a negative intercept anc which suggests a limit of dust concentration below which no dust precipitation is measurable. 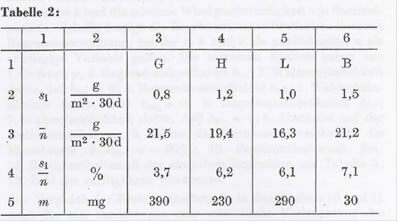 The values in Table 4 acn indicate even more that such a limit exists. In Table 4, the values of the swopped (inverted) regressions are summarized according to Table 3 below. 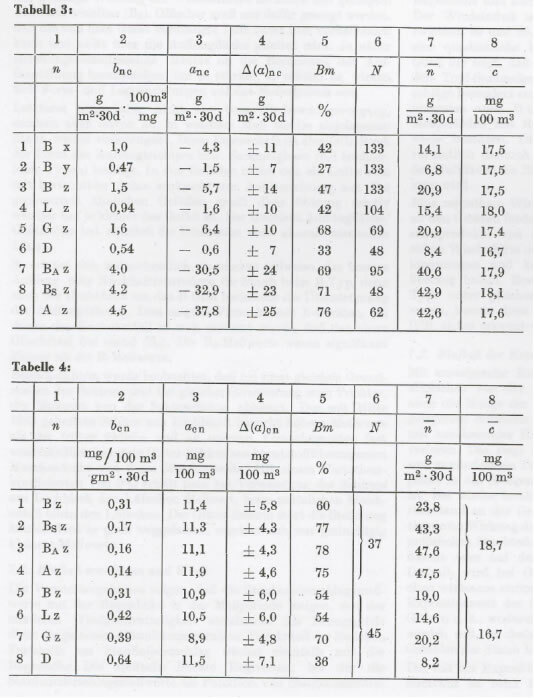 To calculate the values of the table, only those measurement periods were taken into account, where measurements were available for all summarized in lines 1-4 and 5-8 types of devices so that they are comparable, without limitation. Devices with and without screen are clearly distinguishable. The positive axis sections with values between 8, 9 to 11, 9 lie together closely. Undoubtedly rain and wind variables affect the measured values, especially the measuring process. As a rough numerical estimate of the strength of these meteorological parameters, the rain height h and the average wind speed v during each collection period can be used. Table 5 shows the results of a triple linear regression calculation in which c, h and v are applied as independent, n as the dependent variable. The individual columns show: 1st device type; 2. Regression coefficient bnc, 3. Probability that bnc ≠ 0; 4. regression coefficient bnh; 5. probability that bnh ≠ 0; 6. Regression coefficient bnv; 7. probability that bnv ≠ 0; Section 8 on the ordinate an; 9. width of the confidence interval for the single values D (a)n, a =90%; 10 of determination Bm; 11 of determination of the simple regression of Table 3; 12. Number of value pairs. Comparing the coefficients of determination in the columns 10 and 11 shows for all device types a substantial improvement of the relationship. Some critical remarks as to the above test results are to follow. In addition, other noteworthy points have been discussed qualitatively, which on the account of space could not be mentioned here. The fact that various types of devices measuring dust concentration provide significantly different measured values, must be primarily attributed to their varying shapes: This variety in shape causes different interferences with natural air flow. One must assume that the measured values of all devices types are smaller than the true value, because even objects influencing airflow can at best only “neutralise” it, (for example for horizontal streams above a plane, where the (flat) collecting area of the device coincides with the horizontal level), where the flow is horizontal and not accelerated. However, the flow angle varies greatly over time. The extent to which the shape of the devices affects the measured value of dust precipitation, becomes evident when the values measured by dust precipitation devices and dust concentration devices are correlated. The quality of the correlation is considerably higher for devices with flow-influencing structures (A, Bs, BA). The measured values of the devices A, Bs and BA themselves are much larger than those of the other types of devices. The differences in the statistical measures are not very significant within either of the two groups of devices (with windscreen / without windscreen). A certain middle position is taken by the G-device. Its form, an approximately hemispherical (glass) funnel in an open frame – is already more streamlined, in as much as the pent-up air can mostly flow past under the filter. This consideration also shows that in studies on the nature of the airflow, the whole unit must be studied, not just the funnel by itself. The favourable effect of the wind screens is achievable with little effort (Bs). Apparently one needs to take into account that the air displaced by the device can flow past underneath it, not above it via the collecting surface. The closer an object impacting on the airflow reaches towards the rim of the gathering opening, the stronger, it seems, the influence on changes of its form and/or position on the results. This explains probably, at least partially, the better catching or retention of dust in devices of the B-type, because the wire basket around the B-glass affects the overflow of the receiving opening. This was shown in experiments with B-equipment in which the basket was moved so far away that the upper third of the glass was free (B0). The B0-measured values were significantly lower than the B-values. In the shielded devices of the L-type it was observed that, all things being equal, (basic size of the screen and with the same orientation to the filter), the measured value depended on the screen density. This screen which has been available since mid-1963, made of a perforated sheet of metal, causes the measured values to be much higher than those measured by the previously common one, which we used in our test devices almost exclusively. That model has a screen made of plastic-coated wire mesh of 2 cm grid. With a variation coefficient of 9%, the newer shield made from perforated plate (shield with holes in it) arrives at a measured value 1,4 times higher, the insoluble dust content alone 1,6 times higher. The mesh screen barely disturbs the air flow. If it was omitted entirely, that results in slightly lower measured values. The experimental results show that the devices measuring dust precipitation show increased measuring results with increased rainfall, and increased measuring results with increased average wind speed. For reference, the measured dust concentration is used. The percentage of soluble solids in the dust deposition also increases with more rain. The triple linear regression, in which the devices measuring dust precipitation are considered as a function of dust concentration, rain height and wind speed, results in much higher coefficients of determination. The measurements derived from devices with wind screen are statistically not significantly different; they do stand out as a group against the normal equipment. The devices of type A and B arrive at particularly high coefficients of determination; for devices of type Bs one finds 87%. The D-device (adhesive sheet) is the only one to decrease its values with the rain height and also with the wind speed. The wind effect is secured to more than 99.9%, the rain influence from 99 to 99.9%. For the influence of rain, a quadratic correlation results in a context of higher quality, which shows that the D-unit results in lower measurements than the bottle-collecting devices, which is most pronounced when rainfall is low . From the middle of 1961 in addition to the normal model, new D-units have been set up with a rain cover, which almost always resulted in higher values measured in rainy periods. The wind dependence of D-values is probably given by the fact that with increasing amount of substances and particles sticking to the adhesive surface, its binding power of the (already captured) dust lessens. An indirect effect of the rain is that it promotes the corrosion of the equipment. Through rain squalls corrosion products also arrive from the wind screens at/in the collection containers, provided windshield or bird cage protrude beyond the collecting area and have no absolutely safe anticorrosive coating. Only by positioning multiple devices of the same type under the same conditions, could this phenomenon be detected, as it is hardly noticeable in measurements. With increasing exposure time, the amount of dust deposited in dust precipitation devices generally decreases, i.e. apart from the discontinuous effect of rain. Therefore, more substance is lost through wind action with increasing exposure time. This is clearly the case with the insoluble parts of dust, because at least part of the soluble dust has already been dissolved in the raindrops, gets into the measuring instrument and is thus removed from the influence of wind. When such vessels dry up again (B-glass), the dry residue of the dust adheres well to the wall of the vessel. On the other hand, the mechanical action of the rain is not sufficient to wash all the insoluble dust particles on the funnel into the collection bottle or to the bottom of the collecting vessel. That is why devices with a flat collecting funnel and without effective flow conditioning structure will lose significantly more dust with increasing exposure time (Dust loss increases with increased exposure time.) Inserting of grids or similar objects meant to stabilize the airflow, is problematic: It is near impossible to wash the dust caught in these off and measure it. (dust gets caught into the mesh). The L-type loses significantly more insoluble dust particles with increased exposure time than any other type, followed by types G, E, H, N, U, B and h. When the exposure time was extended from 7 to 28 days, a loss of 12% of insoluble substance was noted in L-devices, while in h and B types a loss of 1% must be regarded as unclear whether it exists at all. An interesting effect of exposure time was noted in examining the relationship n = n (k). This test was carried out using values derived from real 7 day measurements as well as values calculated from those to show 28-day values. In the latter case the coefficient of determination of the existence of the correlation was so small that the existence of a relationship could not be established with certainty. When exposure of 28 days was measured, all values lay so closely clustered around the long-term mean, that a correlation to an exposure of 7 days, which certainly exists, was completely obscured. During 60 measuring periods of 7 days, B-devices were studied which were positioned at three different heights above ground: between 0.3 and 2.0 m. It was of interest, whether the amount measured was dependent on the height of the collection surface above ground. The measured values rose measurably with increased proximity to the ground (higher dust levels, closer to the ground), namely more than linear. This effect is very clear for the insoluble dust particles, while only weak for the soluble dust particles. The movement of dry insoluble dust particles settling (“raining”) down is greatly affected by wind and the shape of the device. The dependence on height found also emphasizes, that when comparing devices measuring dust precipitation the collection height must be identical. In our calculations, the statistical measures for successive time periods were worked out separately. It was found that with increased length of investigation period the certainty of the statements increases, too, but the determinants of the regression lines differ only slightly for different periods of time. This fact makes the results of this study valid, though strictly speaking this only applies to the very site of study. Comparing our results with studies in comparable other sites the same numerical values were found, for example for the ratio of long-term means of different device types. This suggests that the results found in the present study may perhaps also apply there. If one chooses a device measuring dust precipitation, one needs to aware of the importance of the spectrum of measurement data, the price, the effort to do proper maintenance, corrosion resistance, the ease of use, and the dependence of the measured value of exposure time and wind speed (and many more). Having reviewed the results carefully and considering the long-term experience incurred when working with different types of devices, the B-device with a simple windshield (Bs) seems to be a particularly well suited device for measuring dust precipitation. The Federal Ministry of Economics and the VDI Commission on Air Pollution Prevention due to the financial and moral support of the present investigations special thanks. [L] age, J.C.: Shielded storage precipitation gauges. Monthly Weather Rev. Vol. 65 (1937), S. 262/265. Köhler, A.: About the Rain Influence with Dust Precipitation Measurements. Posts. Phys. Atm. Vol. 36 (1963), pages 148/156. On a study ground, dust precipitation and -concentration were measured with various devices over several years. Secure correlations between on one hand the different measured values of dust concentration, on the other between the measured values from devices measuring dust concentration and those measuring dust precipitation. The influence of wind, rain and shape of the devices on their results was proven. Dust precipitation and dust concentration have been measured for many years on a test ground by Means of different instruments. Reliable relationships have ran thus been found between different measuring values for dust precipitation, and between the measuring values for dust concentration and for dust precipitation. The influence of wind, rain and the shape of the instrument on measuring values is shown.